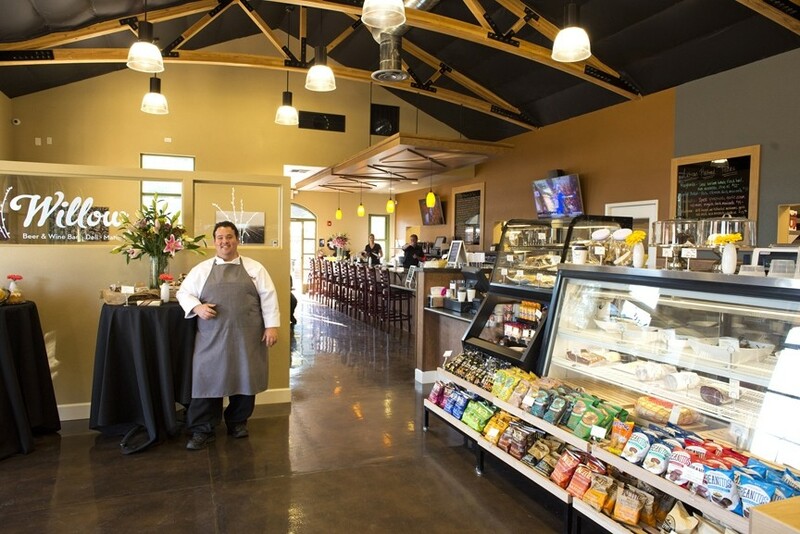 DELECTIBLE DELIGHTS GALORE: Master of the kitchen, Chef Treaver Lynch stands in the entryway to Willow, which also includes a specialty food store, bar, and deli. It’s a supreme act of confidence for restaurant managers to invite food critics to the soft opening of their brand, spanking new restaurant. So I was surprised when I was recently invited to just such an opening, as was my colleague Wendy Thies Sell of the Santa Maria Sun, to taste through the new menu at Willow Beer & Wine Bar. It’s just a short drive from Pismo Beach to Willow in northern Nipomo, where my husband Dan and I met Wendy during the opening. We invited her to join us at our table and it was great fun, sharing food and wine, and critiquing the foods each of us had chosen to sample. The casual dining room and broad patio was overflowing with food and wine industry people that first night; everyone curious and eager to taste the fine cuisine at this new eatery. During three consecutive visits, Willow was busy at lunch and dinner and many patrons were returning for another taste test of their fine foods. In its first week it immediately became a hot destination for that tiny hamlet, attracting diners from the neighborhood and afar. During our first dinner with Wendy, who adores heirloom tomatoes, she chose that starter which was perfectly paired up with Burrata cheese, herbs, pesto, and fresh Olea Farms extra virgin olive oil ($11.50). I was totally impressed by the sinfully rich Dungeness crab cake with fire-roasted corn relish, arugula, and spicy remoulade ($14.25), one of the best crab cakes I’ve tasted locally. And Dan loved his choice of the line-caught, raw albacore tuna with avocado, radish, herbs, citrus, almond oil, and sea salt ($13). Service was slow but understandably considering the fact the staff was in training. The entrée I indulged in was the tender, stout-braised short rib with white corn grits, Barbara’s (Spencer of Windrose Farms in Paso) greens, and smoked tomato-demi glaze ($34). Wendy ordered the fresh seared diver scallops atop pork belly with cauliflower, Brussel sprouts, black rice, and French curry ($26). Dan chose the roasted Mary’s free-range chicken breast with pea puree, heirloom carrots, chanterelle mushrooms, and walnut relish ($22). We found ourselves all satisfied by the good flavors of executive chef Treaver Lynch’s creative menu. All of us were impressed over the delicious foods, from starters to the main course, and desserts. We all said not bad at all for a restaurant’s opening night. 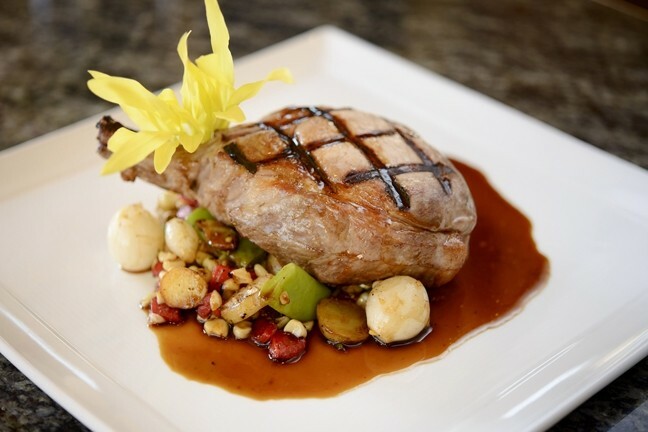 PLUMP PIGS: On the dinner menu, one can order this grilled Berkshire pork chop with grilled corn succotash and red eye gravy. “We want people to drink our wines so I only mark them up $15 each across the board,” he explained candidly. “I have to sell it at an affordable price, and that seemed a reasonable price for a corkage fee.” Nearly every bottle on the marketplace side of the business is available on the wine list, with many excellent choices by-the-glass or on tap, like Tangent sauvignon blanc and Qupe syrah. The desserts, made in-house by the chef and his team, provided a rich finish to our first meal there. I wanted the chocolate mousse with peanut butter mousse and cocoa nibs. Wendy chose the olive oil cake with fruit, but Dan sensibly chose the artisan cheese and fruit plate, which was beautifully presented. Wendy published her Willow dining experiences in the Sun’s Sept. 12 issue. Although we discussed service difficulties that plague even the most experienced restaurateurs during their restaurant opening, we both walked away with high regard for this new restaurant. Lynch and his kitchen team executed some impressive dishes despite it being a full house of hungry patrons (which makes everyone impatient) that night. 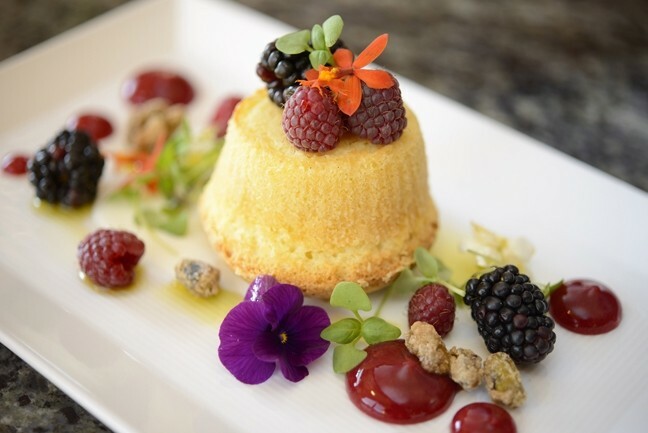 BERRY DELICIOUS: Desserts at Willow include this olive oil cake with goat cheese coulis, raspberry gel, local fresh berries, braised pistachio, micro herbs, and edible flowers. Chef de cuisine Treaver Lynch first met me when he was executive chef at SeaVenture Pismo Beach, but I never met Johnson previously. Both men have many years of experience in the restaurant biz, and they’re both California Culinary Academy (CCA) alumni, class of 2000. Johnson opened a wine bar with his brother following CCA, but left the business for some years to work in finance. The family moved to raise their two daughters in a small town near family, and decided to get back into the food and wine business. Before Lynch was hired as executive chef at Willow, he worked at several impressive restaurants. His previous cooking experiences include working with executive chef Will Torres at Justin Vineyard’s upscale Deborah’s Room, Casa Madrona Hotel’s Poggio Restaurant, the Ahwahnee Hotel in Yosemite National Park, and with his sister, chef Liz Lynch at her Seaside Café in Shell Beach. Lynch describes his cooking style as modern California wine country but said he doesn’t like to narrow it down to one type. Willow Beer & Wine Bar is also a deli and culinary market located on Willow Road, near the corner of Pomeroy Rd. I don’t have to tell South County restaurants it’s a much needed addition to our neighborhood. For that fact alone, they opened to a very warm welcome reception from the residents around them. The restaurant isn’t visible from Hwy. 101 so they’re not likely to get infrequent passersby. After trying their delicious cuisine on four occasions, I’m confident word will spread that it’s well worth exiting the road for Willow’s excellent food and beverages.